At this time The Historical Commission is taking "no position" on the subject of Irving Street becoming private property. We were told last summer by a staff member that the Historical Commission has authority over only the flat surface of the cartway, but not the curbs or sidewalk, which are the property owners' responsibility. The Historical Commission also informed us that they have no authority over public access, parked cars, or any non-permanent structures that may block the street. Currently, several planters are blocking vehicular access to Irving Street. In addition, the curbs on both sides of Irving Street are in disrepair and constitute a tripping hazard, while the sidewalk for 223 S. Jessup was removed, turned into a garden, and blocked with planters. Ordinance of 1896 - Officially dedicated the east end of Irving Street. Note, our lawsuit claims that neither official dedicated not official acceptance is legally necessary for a street to be a public road. Instead, public use and/or public maintenance are the determinative factors - http://www.lgc.state.pa.us/deskbook06/Issues_Land_Use_05_Road_Law_Basics.pdf. Also see book cover "An Ordinance -- To place upon the City Plan certain streets, alleys, and courts in the Fifth, Sixth, Seventh, and Eight Wards, opened and in public use prior to June 6th, 1871. The Select and Common councils of the city of Philadelphia do ordain, That the Department of Public Works be, and the same is hereby authorized to place upon the City Plan the following streets, alleys and courts in the Fifth, Sixth, Seventh and Eighth Wards, of the width as opened and built upon prior to June 6th, 1871:...Essex (now Irving), from Prosperous street (now Jessup) eastward,... Provided, That satisfactory evidence be furnished that the said streets, alleys and courts were opened and in public use prior to June 6th, 1871. Approved this sixteenth day of December, A.D. 1896. CHAS. F. WARWICK, Mayor of Philadelphia"
Note: The City Plans office says that they don't have any evidence on file (to satisfy the above requirement) that the east end of Irving Street was opened and in public use prior to June 6th, 1871, even though it was built in the early 1800's. However, they don't have any records for the west end of Irving either. NOTE: A visual inspection reveals that all four of the streets that make up this intersection of Irving and Jessup Streets appear to be constructed at the same time. Irving is constructed of the same material (grey block) on either side of Jessup Street, and Jessup is composed of the same material (brick) along its entire course. The earliest certified City street map dated 1818: , clearly shows Irving Street (formerly Essex, although the street is not named on the map), runs all the way from Quince to the east side of Jessup Street (formerly Pearl and Prosperous), and states a certification of ascents and descents on listed streets between Locust and Spruce, between 11th and 12th. The most recent tax maps: Map 2, plus other maps - Map 3 and Map 3a (dated 1982) clearly shows the east side of Irving Street as “Irving Street” again, not Parcel 212, but also includes the notation, “Not on City Plan”. THE ERROR OF LOT 212: A City tax map (various dates, the latest being 1969) shows Irving Street (shown only from Quince to the west side of Jessup Street) was opened under Ordinance 12-27-1895 B/S 2/23/1897. However, it also shows the east side of Irving Street as a parcel (#212), but that appears to be an "error" which was noted in the City Plan document, entitled Original Entry page - full page, partial page. The "error" was dated 1946. In the Deeds Office, the clerk indicated that documentation on Parcel 212 ended in 1921 with an entry of “error”. We believe that the east end of Irving Street should not have been designated as a parcel at any time, but when it was designated, it was done in error. To further support this theory, in the City Archives there is an index page for Parcel 212 with no included record. It simply states “BLANK” on Transfer Reference - see attachment. That part of Irving has always been a street and constitutes the only access to two alleys and the courtyards of 15 properties (not including 221 & 223 S. Jessup Street). E.V. Smith Fire Insurance Atlas, 1922, pl. 14 NOTE: The encircled area is part of this map and has nothing to do with the privatization of Irving Street. Water Mains: Card (Plan described, dated1848) and later Map - East end of Irving Street is on this City of Philadelphia map. Storm drains and Sewer: Card, Cover, and Map (1905) - This map shows S. Jessup Street's rounded curbs and angled storms drains (constructed by the City of Philadelphia), leading into the east end of Irving Street and designed to take storm water from both the east end of Irving Street and S. Jessup Street - definitive evidence that the City recognized the east end of Irving as a public street and incorporated it into the City's infrastructure, as such. The water system for these streets was built in 1848. But, the most obvious, if not 'de facto', evidence that it was the intent of the City of Philadelphia to include Irving as a “street” on the City Plan and not a “parcel”, is the location of two storm drains and sewers (built in 1905), plus the rounded curbs and sidewalks at the east corners of Irving and Jessup Streets. It is particularly unlikely that a parcel would have two storm drains and rounded curbs located on either side of a lot in built at an angle and in such a manner. It is a typical “crossroad” construction, not a “T” intersection. 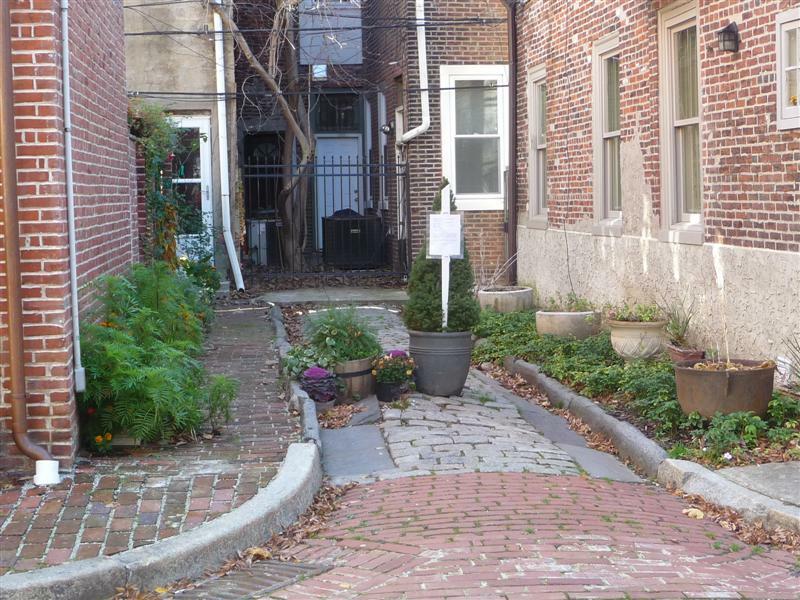 The clear intention of the City appears to be that Irving Street was meant to cross Jessup and connect with the back alleys and courtyards. Several of these properties deeds reference Essex (now Irving) Street. Our deed (217 S Jessup, Parcel 118) states that we have “free and common use, right, liberty and privilege of the aforesaid Court as and for a passageway and watercourse at all times hereafter, forever”. 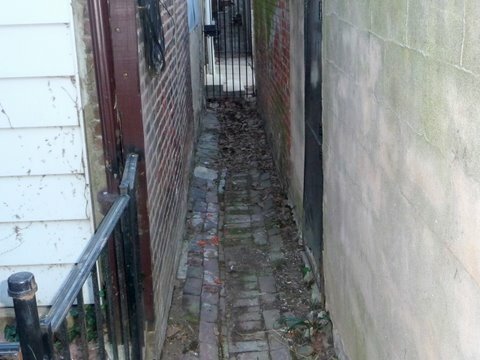 The only access to the alleys, brick drainageway, and back courtyard “passageway and watercourse - which drains onto Irving St- is through the east end of Irving Street. There are no other public nor private passageways off of Jessup Street through which that area can be accessed. 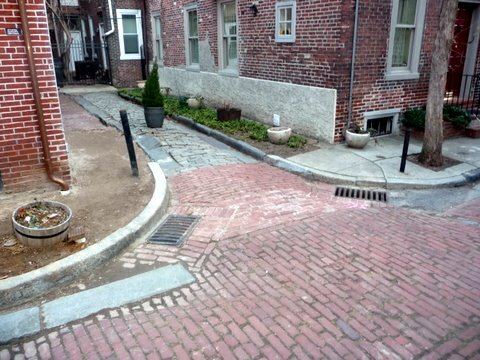 Also, if Irving Street was not meant to be a street, why does the brick drainageway (watercourse) in our alley connect to Irving Street's gutters, having no other outlet? HOW TO PUT IRVING STREET ON THE CITY PLAN? The east end of Irving Street has been in constant use as a street by the public for almost 200 years. We believe that the solution to Irving Street’s untitled status is to amend or correct the City Plan to include the original and entire course of Irving Street, from Quince Street to the east side of Jessup Street. We suggest that this might be best accomplished by utilizing the City Plan Action Request Process (Option 3). Our other option was to ask Councilman Frank DiCicco to put legislation before City Council, but he decided against it.